Valentines Day should be more then just celebrating with your significant other, it should also be about celebrating the friendships you have with your besties. I have been hearing the term “Galentines” Day in reference to celebrating Valentines day with your girlfriends. I am not sure how I feel about this term but it seems to be gaining lots of popularity! 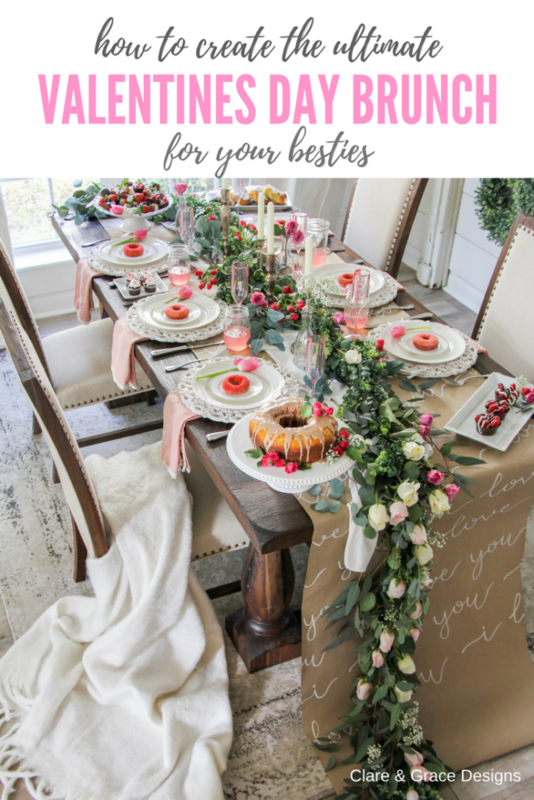 This Valentines Day I wanted to create the ultimate girls brunch that you can recreate for your besties. 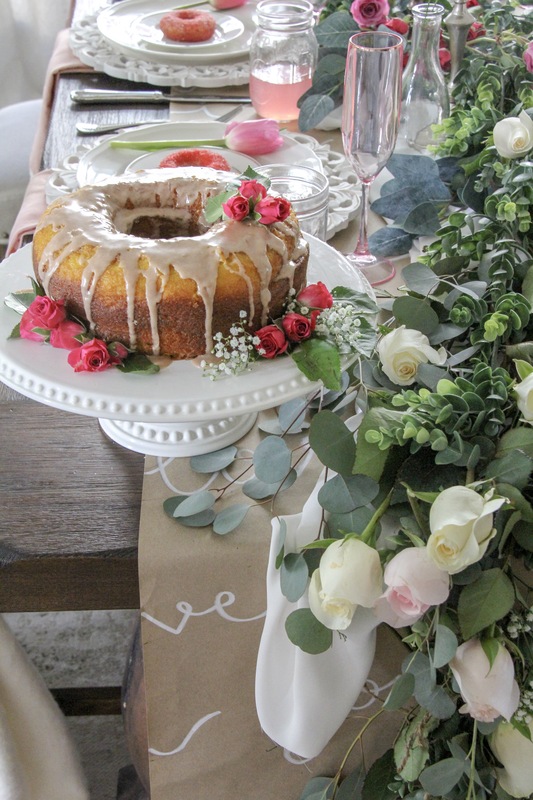 With some flowers, faux and real, and an easy DIY scroll you can host a beautiful Galentines Day brunch. Ready for some ooooohhhhhs and ahhhhs ladies? I hope this post also inspires you to get into the Valentines Day spirit. 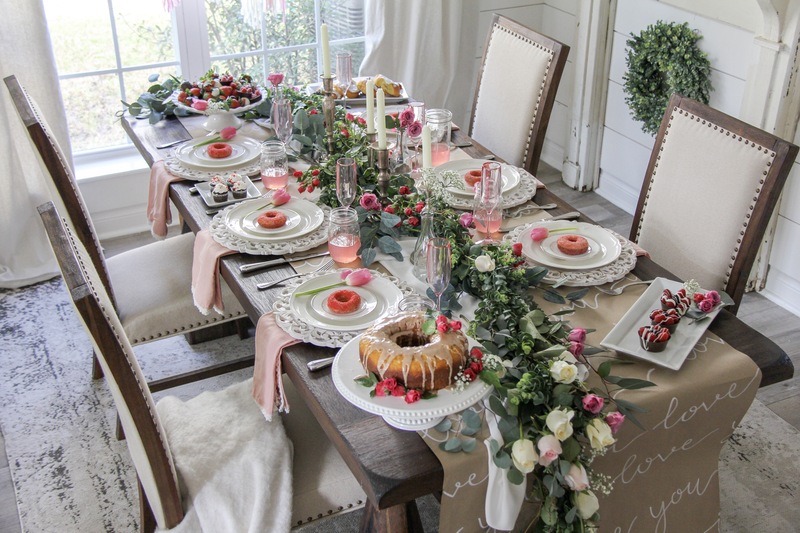 Although, I do not really decorate my home for Valentines Day, this tablescape sure got me in the mood to pull out all the pinks and add more flowers to my home decor. 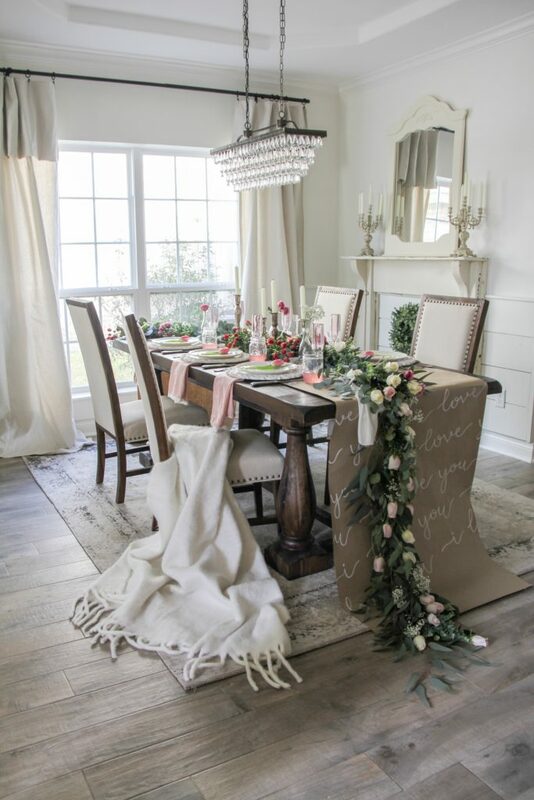 For the base of this tablescape I created an easy DIY scroll. 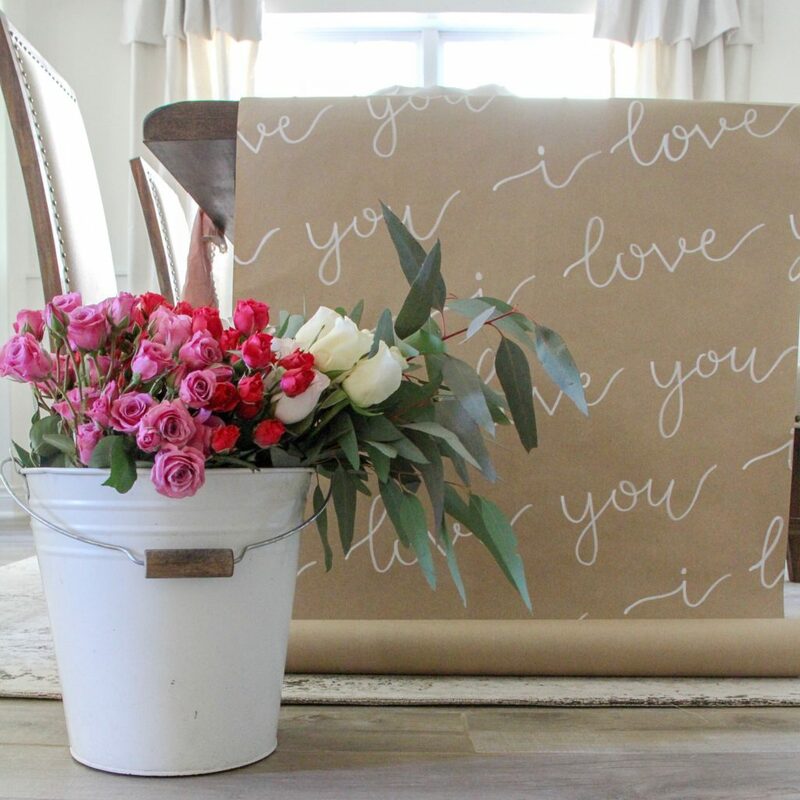 You can find these kraft paper rolls at Walmart or I found this one at the Dollar Store. I took my pencil and wrote out “I love you” continuously so it looked like it was writing off the page. 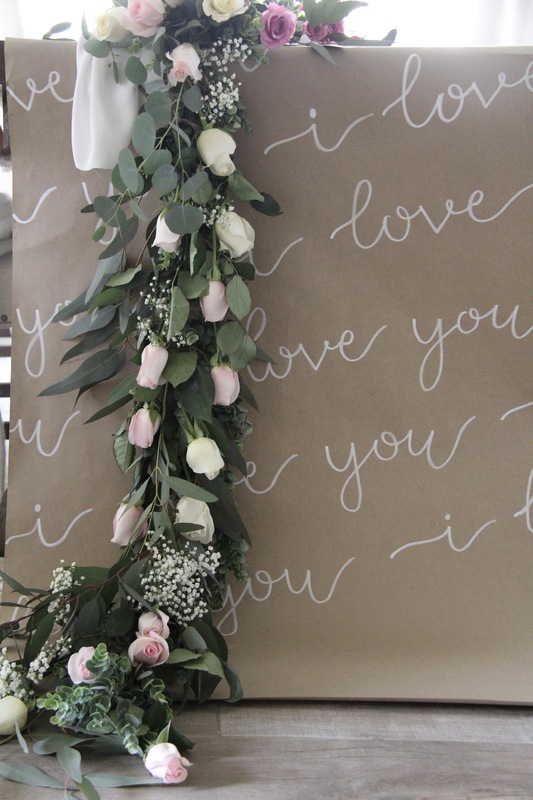 You can even just do a simple XOXO if you don’t want to write out in script. I then used a white Sharpie Paint market that you can also find at Walmart or any craft store and traced over my pencil. 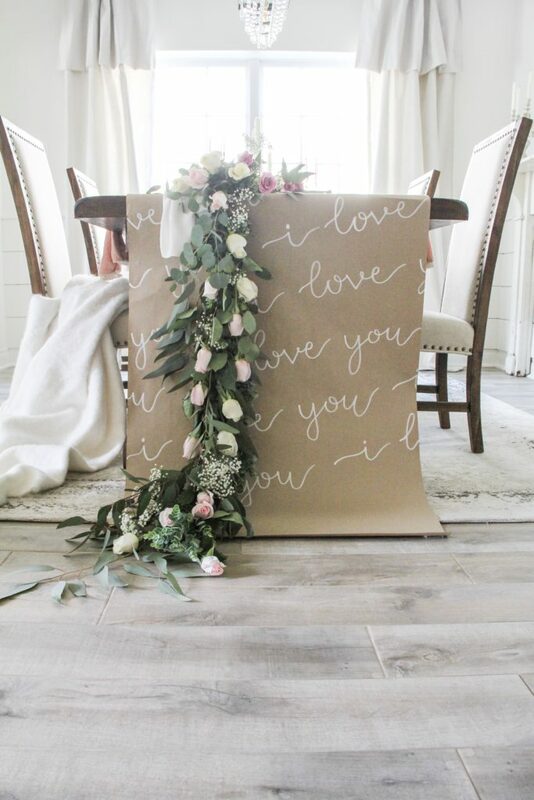 I knew I wanted the flower garland to drape on the floor so I made sure I the kraft paper was also long enough to drape on the floor. I love how the effect of flowers draping on to the ground creates a very elegant and dramatic look. 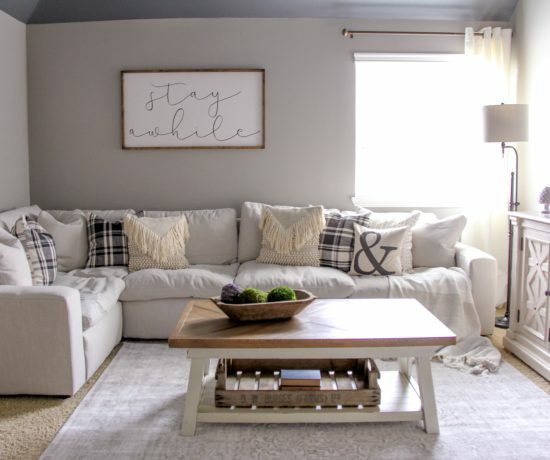 Extra Decor Tip: Another fun way to create the same look would be to use an old white tablecloth or some cheap white fabric and black paint to paint on some big XOXOXO. For the flower garland I used faux and real to create this look. Flowers, especially roses, can be expensive so I wanted to try and cut my costs as much as I could. I had the base green garland already, I actually used it in my Christmas staircase garland so I had plenty to use. My favorite place to find reasonably priced greenery and faux flowers is hobby lobby. You can find the garland that I uses in this table here. I used 6 strands of this garland and ties each end together using string. Depending on the length of your table you may need more or less. After I had the base ready, I then used a variety of real roses and eucalyptus to add to the base. I bought all my flowers at Trader Joe’s. 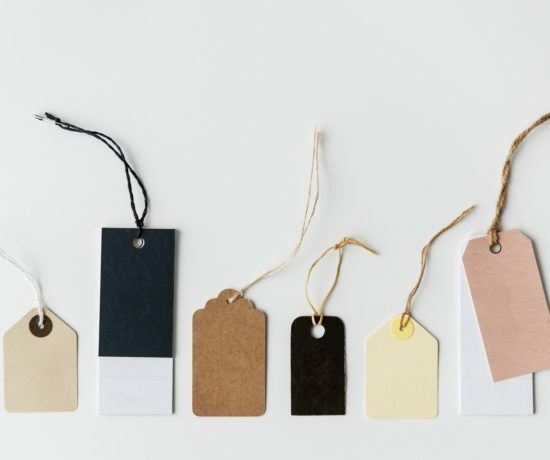 They have a beautiful selection and always the best prices. On the top of the table, I just stuck the flowers into the base garland where I wanted them to go. I spread out the different colors evenly, and added in eucalyptus. I also added in some faux eucalyptus stems as well. The draping garland was a little more difficult to create. Since you obviously can’t just stick in the flowers or they would fall to the floor, I used string to tie each flower stem to the base garland. I also tired in a few strands of eucalyptus. You can be creative in where you want the flowers to be placed, there is no right or wrong way to do this! I like the flowers to be loose, and a bit messy looking. At the bottom of the garland on the ground, I stuck in some more flowers and eucalyptus to create a dramatic effect. What is more romantic then candles for Valentines Day? I added these vintage candle holders to the garland and it was the perfect last touch. 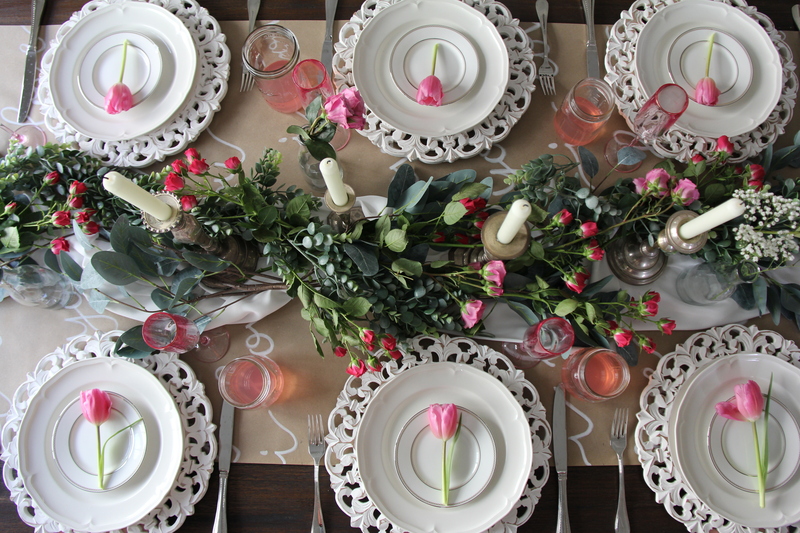 For the table setting, I found these adorable white charges that look like laced wood at homegoods. 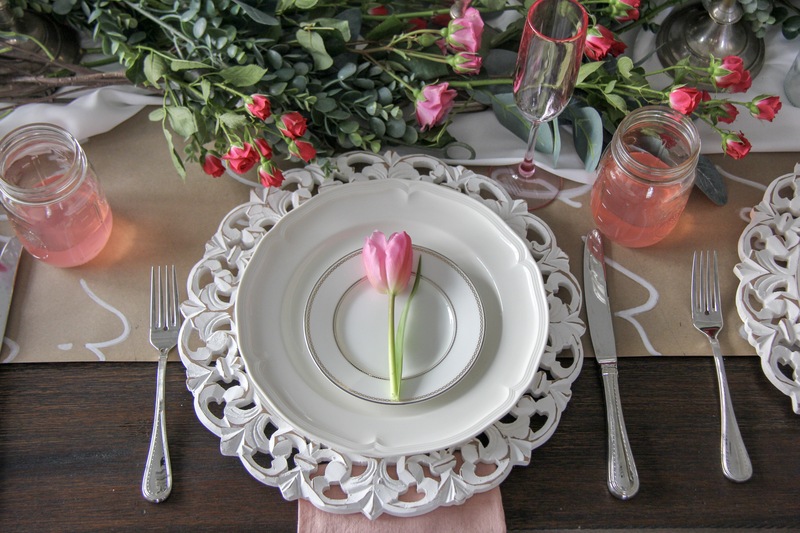 I used simple white dishes and added tulips to each place setting. 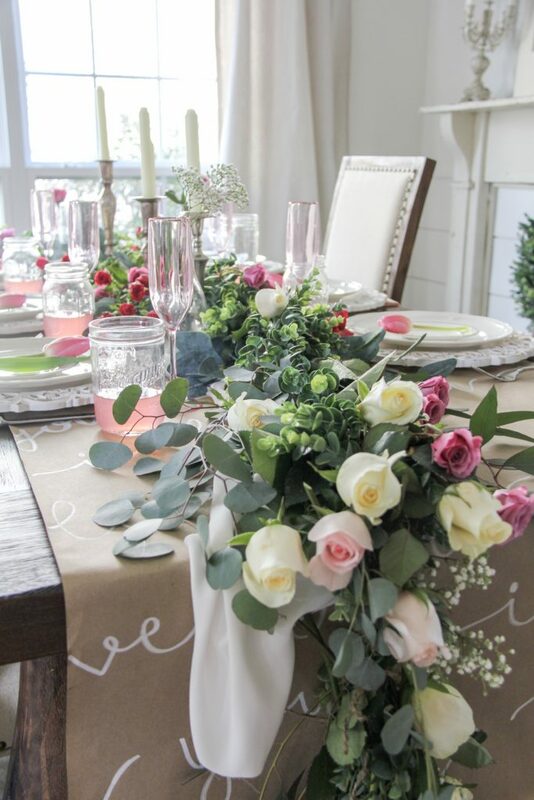 I topped off each place setting with a light pink napkin from Pier1. Don’t forget a fun pink drink! I added pink lemonade to mason jars, and champagne to some fun pink champagne flutes I found at my local grocery store. Since we are now done setting the table, lets not forget about the food!!! I wanted to keep to the Valentines Day theme and use Pink in my food as well. My good friend, Rebekah baked these sugar pink donuts and they were the perfect touch. I also bought a store baked bundt cake, added the brown sugar cinnamon glaze, topped with some flower garnish and VOILA! You never wold have guessed it was a store bought cake! Rebekah also made some simple chocolate bowls and filled them with red berries. They were almost too pretty to eat! I do have to say, next time I’ll have to step up my food game. Although I love to decorate, cooking and baking is not my forte! Thank goodness for amazing friends to step in when I needed some extra help. Thats what friends are for! Well thats a wrap friends! 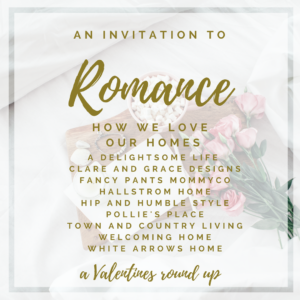 I would love to see the tablescapes you create for your BFF’s for Galentines Day or even if this just inspires you for another party idea. I would LOVE it if you would tag me on Instagram @clareandgracedesigns so I don’t miss out! 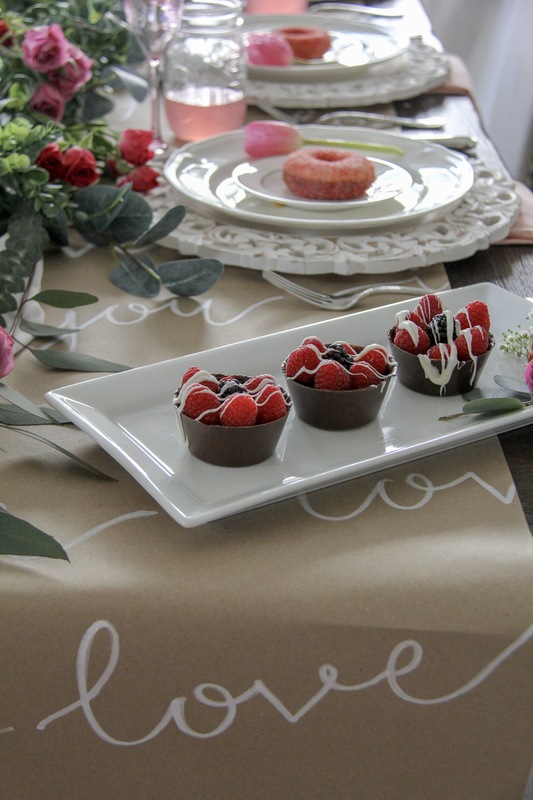 Happy party planning and have a very happy Valentines Day, no matter how you choose to spend it! Thank you for hosting!!! I am so enjoyed reading my post! 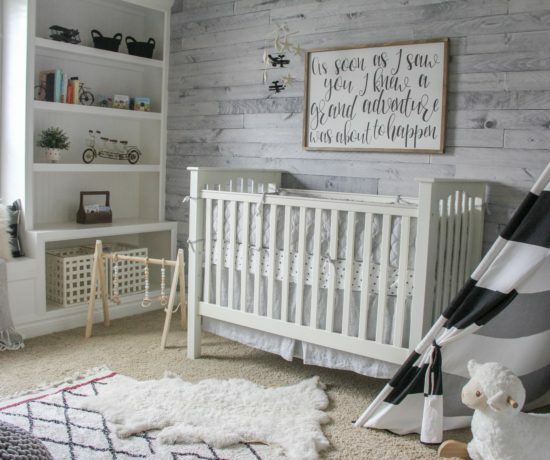 I can’t wait to see what you do in your spring decor! Omigoodness, this is just gorgeous!!! 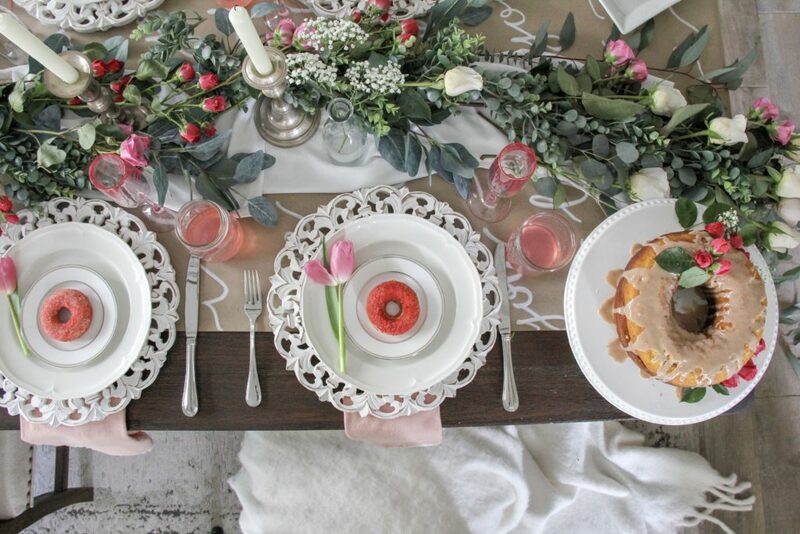 Is it possible to be in love with a table setting? If yes, then Cupid definitely struck my heart with his bow. So so pretty! Thank you Jennifer! I am so glad you enjoyed it! This is stunning. I love decorating tables the same way. I’m sharing on my FB page today. Yes, it’s beautiful, but too staged for me. I am tired of seeing picture-perfect settings, with no people present. Who has to sit on the artfully-arranged blanket? im so sorry you feel that way Diane. This was just in hopes to inspire, and a pretty picture. It is what I enjoy doing. Have a wonderful weekend. This all takes my breath away! I can just imagine your besties walking in the door to this beautiful party!! So inspiring! 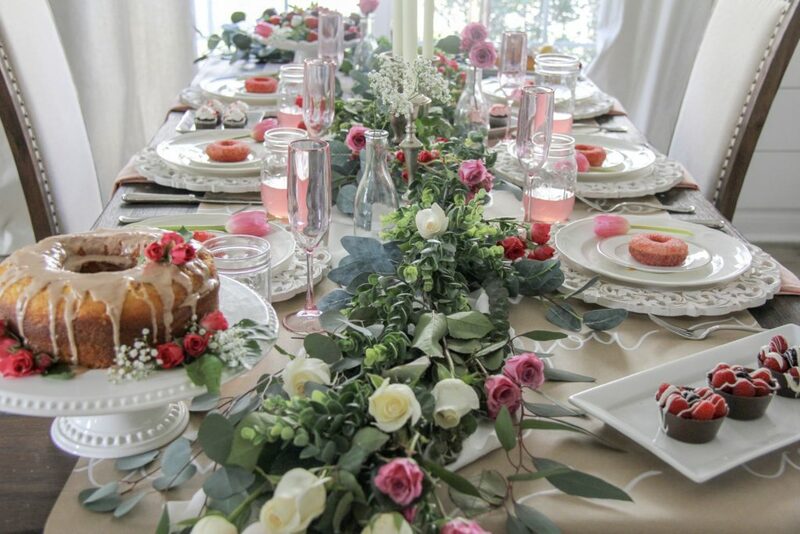 Your table setting is just amazing! Loved the table runner. So fun and easy. Thank you for the galentines idea. Im so glad you found it easy to create! it was also very fun! It’s too beautiful to mess up by actually sitting down and eating. I bet your friends felt pampered and loved. Pinned. Thank you Trish! It was a fun time! 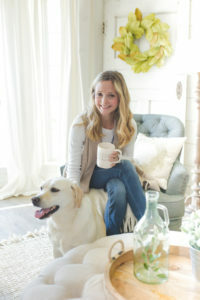 Leanna: All I can say is: This post is dripping with gorgeousness ! thank you so much sandra!! You are so so kind! This tablescape is fantastic. I don’t think you should worry about upping your food game! Thank you Jeanne! I am so glad you think so, because this lady hates to cook! I am so glad you think so Jeanne! This lady hates to cook!